Calling all Grey’s Anatomy fans! It sounds like the love triangle among Meredith, Link and DeLuca is about to get off-the-charts intense. 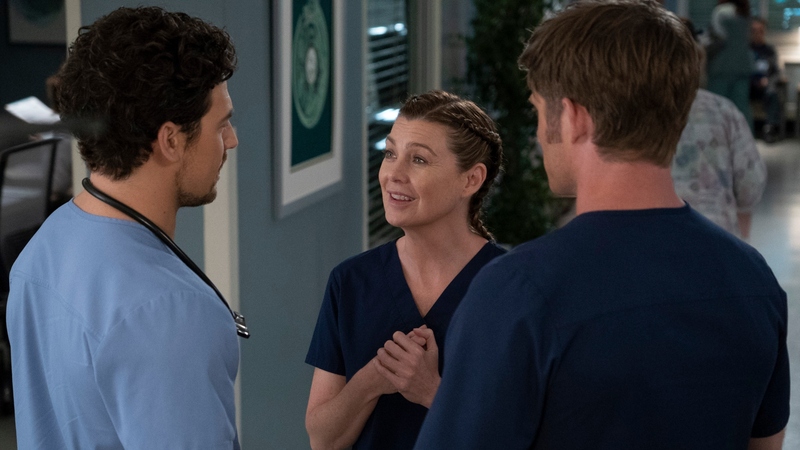 Speaking to two different outlets this week, Giacomo Gianniotti hinted at DeLuca and Meredith heating up and gave us a tease for what’s to come for all three characters as we head into the back half of Grey’s Anatomy season 15. Speaking to TV Guide at the Television Critics Association winter press tour on Tuesday, Gianniotti said, “I think DeLuca likes to think he has it in the bag already and I’ll just stick with that answer… He’s Italian and he’s romantic. Who doesn’t love a romantic man?” He also reflected on the power of the now-infamous elevator scene, wherein Meredith and DeLuca waited out a power outage together in a stuck elevator and their conversation turned intimate. Thursday’s episode of Grey’s Anatomy is slated to follow Meredith and DeLuca as they finally go on their first real date on New Year’s Eve. But again, Gianniotti isn’t revealing any details. “Let’s not get ahead of ourselves, let’s see how things play out and then we can get to that after,” he told ET. We’re on the edge of our seats.